Get your classroom ready for St. Patrick's Day with this FREE Easter! This product allows students to be use themed words in their writing. It supports narrative, opinion, and informational writing, spelling, and the writing process. Each card has an easy to read font and a bright, crisp picture to match. Simply print, laminate, and put in a pocket chart on on your word wall you're all set! 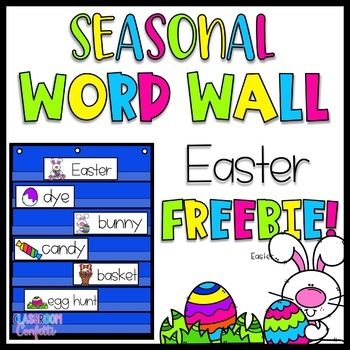 There are 12 FREE word wall cards included in the Easter Word Wall set to celebrate this holiday. **If you would like a word added to the list please let me know if the questions section!